If we're going to have a story about a carnival, we need appropriate music. Alright, there we go. Nowthen, in Carnival of Monsters, you take on the role of leader of a carnival, looking to attract people to your show. The best way to do that is to go out and capture the most magnificent creatures you can and put them on display. The game is up on Kickstarter now. Step right up, my lords and ladies, and prepare to be mystified by the most bizarre, the most exotic, the most fantastic sights you have ever yet to behold! Step behind this curtain—for the merest, tiniest contribution—and your world will be changed forever! For this is the Carnival of Monsters, and it offers a world of wonders! 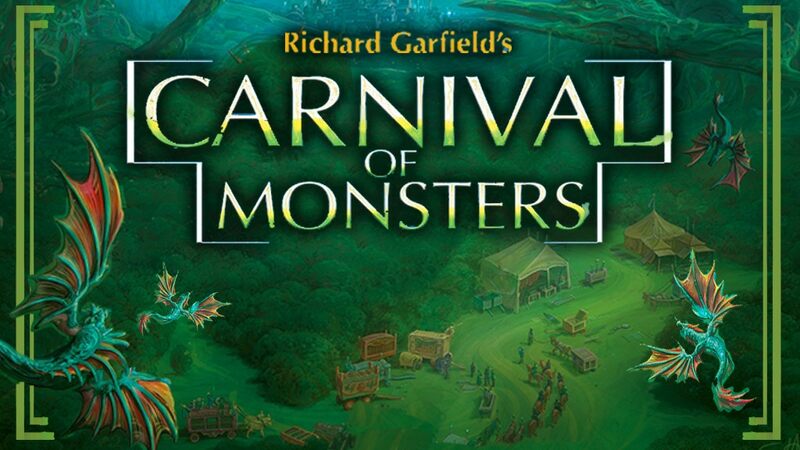 AMIGO Spiel + Freizeit GmbH invites you to experience Richard Garfield’s Carnival of Monsters, a new game from the genius behind such hits as Magic: The Gathering, RoboRally, and King of Tokyo. Garfield’s most recent design, this game challenges you to explore exotic, fantastic lands and collect extraordinary monsters to display in your carnival, earning the adoration of the crowd and the fame that only a true carnival master can enjoy. Because we believe that great games deserve great art, we have teamed up with some of the most talented artists in the world of gaming today to make Richard Garfield’s Carnival of Monsters a celebration not only of great game design, but of great game art as well. But this magnificent creation won’t be possible without help from you. By backing this campaign, you can help AMIGO and this pool of talented artists make this project a reality. Explore the sample artwork below, learn more about the game and the artists, then join us by backing this project. Together, we can make Richard Garfield’s Carnival of Monsters the magnificently beautiful game that we know it can be. The Kickstarter campaign is up and running now. It's set to go for another 26 days.